It wasn’t until recently that every brand new car came with a spare tire and a set of tools to install it in case of an emergency. Nowadays, several popular car manufacturers choose to no longer include a spare tire set in order to save money. Spare tire sets can be sold separately, but this tends to be more expensive for the consumer. As a result, many car owners are driving around without a spare tire. The experts at CarRegistrationAdvisors.org absolutely recommend investing in a spare tire if a car does not already have one. Driving without a spare tire can be inconvenient, dangerous and costly in the long run. Having an extra tire is important, because if a tire happens to fail, the car will at least still be drivable until another tire is bought. This is especially important if a tire fails while the car is driving on the road. Still not convinced? Our writers at CarRegistrationAdvisors.org have two strong arguments for why every car owner needs a spare tire. No one can predict getting a flat tire. The truth is, flat tires are a fact of life, especially when driving on the highway. Debris from trucks and other cars end up on the roads of the highway all of the time. Some of the debris can be sharp, posing a risk for tires that run over it. Sometimes, flat tires are just unavoidable. When flats do happen, having a spare tire and the tools to put it on become incredibly handy. Now, the driver does not have to wait and spend money on getting the car towed and taken to an auto shop. Instead, the car can drive away as if nothing happened, saving both time and money. The only drawback to using a spare tire is that many spares are significantly smaller than the rest of the car’s tires, especially if the spare came with the car. Spare tires are not suitable for high speeds, making them unsafe to use on the highway for an extended period of time. Spare tires are not meant to replace the original tire. Instead, spares are meant to keep the car mobile until the owner is able to buy a new tire. No tire lasts forever. 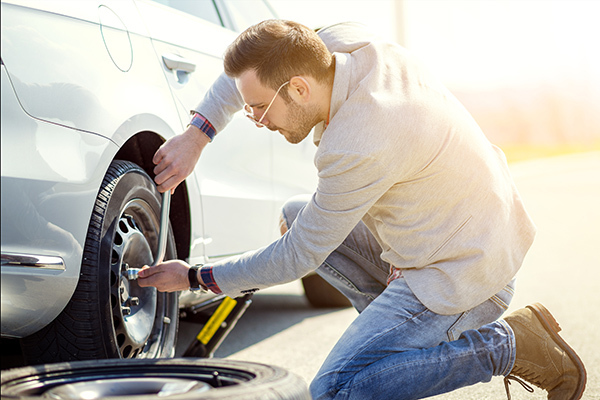 In fact, the experts at CarRegistrationAdvisors.org recommend changing tires every three to five years, depending on how often the car is used. Tires can be costly, but without them, a car cannot go anywhere. When money is tight and a new tire can’t be bought right away, the spare tire can be used for a limited amount of time. This is useful for when the driver still needs to go to work, run errands and handle other daily tasks. Keep in mind that spares aren’t meant for high speeds. The team at CarRegistrationAdvisors.org strongly discourages driving on the highway with a spare tire. Doing so is dangerous and can damage the spare, as well as the rest of the car.